Hello World in Python. Bright green text. 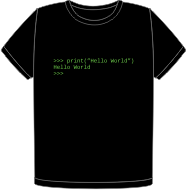 For each t-shirt, we donate 3.00 € to Python Software Foundation.